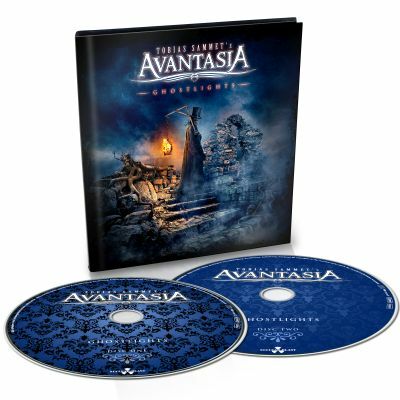 AVANTASIA - GHOSTLIGHTS LTD. EDIT. (2CD DIGI-BOOK) | Online Shop | Wizard LTD. Album: "GHOSTLIGHTS LTD. EDIT. (2CD DIGI-BOOK)"
“Heavy Metal for the biggest stages of the world! On December 11th, a foretaste in the form of the opulent track &apos;Mystery Of A Blood Red Rose&apos; will be released. As from March 2016, an allstar ensemble will hit the road for the »Ghostlights« world tour. “Michael Kiske, Jorn Lande, Ronnie Atkins, Bob Catley, Eric Martin, Amanda Somerville, Sascha Paeth, Miro Rodenberg, Felix Bohnke, Andre Neygenfind and Olli Hartmann will be there for sure,“ the initiator reveals. And that’s for sure: If Tobias Sammet’s AVANTASIA will take the listener on a three-hour journey in another world during the shows in spring in every evening, it’s a superlative experience.